Extremely fortunate to come to His lotus feet when she was just a tiny girl in 1940s, Mrs. Karunamba Ramamurthy, lovingly addressed as Kannamma, has a priceless treasure trove of incredible memories of the yester years. She is also the author of the famous book "Sri Sathya Sai Anandadayi - Journey with Sai". This happened in the mid-forties. Once a lady, a friend of mine, from Bangalore wrote a letter to us stating that Bhagavan had come to their house, and asked me to come over for His darshan. After receipt of that letter we proceeded from Mysore to Bangalore. We had His darshan in a devotee’s house. Incidentally, the day happened to be Bhagavan’s birthday. After the function, Bhagavan told everyone present to partake prasadam. You can imagine that by this time we were rather enamoured by our sweet interactions with the Lord, and it took only those words for my family to resolve to make the arduous journey to His abode. Soon, my father and his sister visited Puttaparthi for the first time, in 1946, when Swami was barely 20 years old! In those days, only the old Mandir existed; even today it stands close to the Sri Venugopala Swami temple in the Puttaparthi village. At that time, it had just been constructed. My family stayed in an open space beside this old Mandir. As Brahmins (belonging to the priestly class), we cooked our own food, which was done in the open. During her visit my mother respectfully asked Bhagavan, “Swami, will you accept the food that we cook and bring for You?” And to her abounding joy, Swami said, “Yes!" Since then, due to His grace, she was able to cook and serve Him food on many occasions. My mother had only been initiated (given mantra upadesham) a year before she had her first darshan of Bhagavan. 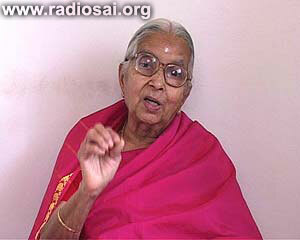 However, she was very devoted to Bhagavan and asked Him for anything and everything. In those days there were not more than 35 devotees; in fact, that was a big figure then! A respectable lady, Mrs. Sakkamma, well-known as a coffee-estate owner in those days, used to come often from Bangalore (Kodugu District) and stay for about three to four days. She was the one who used to take upon herself the task of arranging everything for Bhagavan, be it His bath, water, food, or anything else. For those who are not aware, Bhagavan has stated that the first period of His divine life was characterized by leelas – the sports of the Lord. It was because this aspect was prominent then, and also because Sakamma adored and related to Swami as a young boy that she could at times take the liberty to make such demands. And Swami too was very ready to grant Sakamma’s prayer in a spectacular way on that occasion. The next evening He took all of us along with Him to the Chitravathi River, which was a copious flow during those days. At about 6.30 p.m., Swami suddenly told us all to follow Him, and He walked up a hillock and stood there. He showed His empty hands and then asked us if we were all ready to see what followed. We waited with bated breath to see what would unfold… There, suddenly appeared a brilliant light, and in the middle of that sublime brilliance stood Swami! All of us assembled there, at the foot of the hillock, saw this Divine spectacle and were dumbfounded in awe. A Divine aura had completely surrounded Swami as He stood there on the hillside. The light was a pulsating brightness, so dazzling that it was overwhelming. But at the same time, the luster was so soft and gentle, because of which we could withstand the purity of its luminescence. And then, Swami slowly came down a few yards, but the effulgence continued to surround Him. When He further descended, the aura was still there around Him, undiminished. We were stunned and speechless. How can one describe that unprecedented event? We were just shocked with delight and overjoyed at the divine gift bestowed on us. After this historic event, we all returned to the old Mandir and sang bhajans. At the end of this session, we offered Him arathi. Swami then told us the significance of the darshan He had bestowed on us just then. He explained that there are many types of devotees and everyone worships God in the form they like the most; the choice is totally up to them. Each one will become aware of the brilliance of the Divine in the form they worship and that is dear to them. After six days, Jesus took with him Peter, James and John, the brother of James, and led them up a high mountain by themselves. There, he was transfigured before them. His face shone like the Sun, and His clothes became as white as the light. Just then, there appeared before them Moses and Elijah, talking with Jesus. 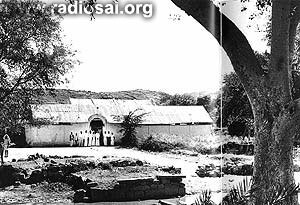 The old Mandir was built in the year 1945. During this period, the unique opportunities devotees had for divine conversation with Bhagavan were absolutely amazing; no one has enjoyed such opportunities later. Swami used to come and just sit with us and talk. There was not even a time limit then! The old Mandir was only a small shed, and needless to say there wasn’t ample space there. It was built by a devotee, Mr. Devaraj. The hall was shared by all, ladies on one side and men on the other. 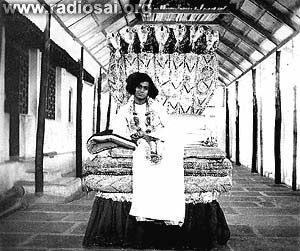 In fact, Bhagavan Himself used to sleep in the hall on the floor; there wasn’t even a cot! We were very fortunate to perform Pada Puja (worship of the feet) to Swami in the old Mandir; it was performed with devotional songs. During the puja, we were allowed to sing any song we liked. “Pesara Pappu Kosamu Poena…. (I went to bring Moong Dal…)” is one of the songs we used to sing. Swami used to like Moong dal cooked and served in the meals those days. 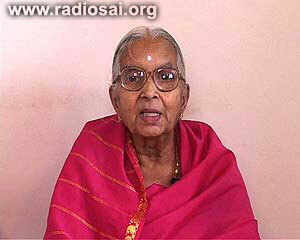 Mrs. Sundaramma, a devotee from Karnataka, used to sing that song beautifully. During the puja, we used to spread a white cloth on the ground. Over that we placed castor oil and haldi (turmeric) powder. These two were then mixed and the paste applied to the soles of Swami’s Feet. After gently pouring scented water (panneer) over His feet, we offered our salutations and touched His feet in reverence. Swami would leave the puja only after we all had taken padanamaskar. Of course, when He walked over the white cloth, His feet made impressions (Pada mudralu) on the cloth, and these became prized objects of devotion. Sometimes, we used to place a pad on the floor. When Swami stood over this, we poured scented water and washed His feet, and then, wiped them with a towel. After this, we applied turmeric powder and vermillion on His lotus feet. Finally, we placed a flower garland around His neck and sang bhajans. This is how we performed Pada Puja in those bygone years. People of great social stature such as the Maharaja of Mysore and Basavaraj Urs used to visit Swami frequently those days. All these important people used to sit around Swami, who was just a young boy. During Dassara and other such festivities, all of us got together, with great love and devotion, arrayed Swami in fine garments. We used to assemble elaborate carriages for Him such as the Swan Vahana (vehicle in the form of a swan) and Nandi Vahana (carrier in the shape of the sacred bull, Nandi). 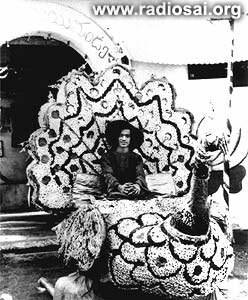 Flower decorators from Bangalore often brought varieties of blossoms that were placed on these Vahanas and used as palanquin for Swami. During Dassara, Swami used to visit the village in a different Vahana each day. The decoration for Swami was based on the Dasavatharam (ten incarnations of Lord Vishnu). Swami’s Vahana was followed by a band and a Shehnai (folk music) party. And behind this was the concourse of devotees. Arathi was offered to Swami once the procession returned. Then, coconuts too would be broken and we all offered salutations. The programme would conclude by 9.00 p.m. Again, by 2.00 a.m. we would gather around the Mandir. Residents from the hamlet used to attend all these festivities regularly without fail. Swami used to take us all to the Chitravati River every afternoon. We used to return to the old Mandir only by about 6.00 p.m. As the old Mandir did not have extra space, the bank of Chitravati was the interview room. 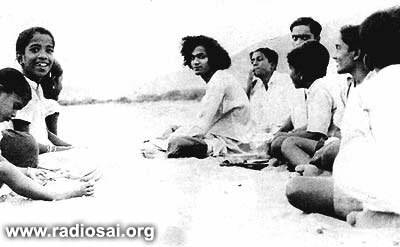 Swami used to answer all our questions on the sands. Those who had unfulfilled desires in their lives, such as not being able to have children or were troubled with material constraints, prayed to Bhagavan to bless them. He often materialised many idols of deities. He also used to create fruits and flowers, which He distributed to everyone around. On one occasion, He created an apple which He cut into small pieces and passed around to all of us. The wonder was that every devotee got a fair share of the same small apple! His will produced surplus (Akshayam) so that all could partake of the divine prasadam. On one occasion, He created an apple which He cut into small pieces and passed around to all of us. The wonder was that every devotee got a fair share of the same small apple! His will produced surplus (Akshayam) so that all could partake of the divine prasadam. Another feature of the apple was the blemishless texture of its skin; it was absolutely smooth and shiny. When we asked Bhagavan about the wonderful quality of the apple skin, He replied that blemishes represented strife in life, which resulted in rebirth. To drive this lesson home, He had created such perfect apples. Another feature of the apple was the blemishless texture of its skin; it was absolutely smooth and shiny. When we asked Bhagavan about the wonderful quality of the apple skin, He replied that blemishes represented strife in life, which resulted in rebirth. To drive this lesson home, He had created such perfect apples. One day, due to some reason, the fire in the kitchen was not lit. Swami, then, went inside this room, and taking a cloth, wiped all the cooking vessels thoroughly clean. He then placed lids on all of them and left the scene. At about noon, Swami told us to open the lids of the vessels. When we did that we were shocked to find a variety of cooked delicacies! We served this delicious food to all the devotees present, which was no small number. But the vessels never became empty! He had willed all the containers to remain full till all ate to their heart’s content! In those days there was never enough rice or paddy stock in the kitchen. However, none remained hungry; there was food for all and in abundance! It was a simple leela for Bhagavan to ensure this. …the crowds followed him on foot from the towns. When Jesus landed and saw a large crowd, he had compassion on them and healed their sick. In those days, my mother used to stay in the kitchen of the old Mandir to cook for Swami; that was a tiny room. Devotees used to come from all over the country at all hours of the day to see Bhagavan. 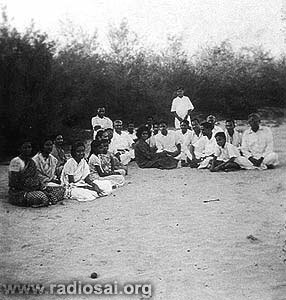 Once a group of devotees of the popular Tamil saint, Sri Ramana Maharishi, came to see Bhagavan. They had arrived at dusk, when the village was enveloped with darkness. Navigating down the road was a problem, and to compound the issue, they did not understand the local language, Telugu. However, one villager thought of my mother and directed the visitors to her as she knew Tamil. They informed my mother that they had come all the way from Thiruvannamalai hearing that God had incarnated here. They had come to have His darshan, offer their prayers and perform puja to Him. And then, they questioned her on the modalities of performing such a puja. She replied that there was no such worship necessary, and that devoted bhajans alone were enough. When this group saw Bhagavan, He was very happy. 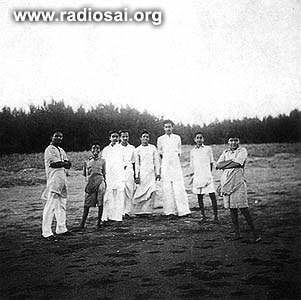 Swami told them to stay with their guru (Sri Ramana Maharishi) and to sing bhajans with devotion and dedication. That alone is enough to earn merit, He conveyed to them. Hearing this, my mother was ecstatic as Bhagavan had given the same upadesam (advice) to my father too. Diesel Generator Runs on Water! During those days, there were no street lights. The roads were dark and uninviting in the evenings. A couple of bulbs glowed powered by a diesel generator for which devotees procured the fuel. Devotees started complaining that there was no light. Hearing this, Swami asked for water in a bucket from the nearby well. He then directed them to pour the water into the generator tank. Wonder of wonders! The bulbs lit up and burned beautifully throwing bright light all around! One evening, during a celebration, when the procession was about to start, the bulbs failed to light up! At that time Swami was sitting in an old room at the rear of the old Mandir. This amazed everybody, but maybe there were still a few doubting thomases. Swami again asked the devotees to fetch another bucketful of water and directed that it be poured into the generator – the bulbs continued to burn beautifully. Nobody had any doubts about His divinity that evening! Swami used to sit along with devotees and discuss with them various topics. Many came to Him for advice, which He offered with the greatest of concern. The number of devotees in the Mandir in those days often did not cross single digits; even ten people on normal days was a big number. One day, it was my mother’s chance to decorate the idols and light the lamps. While she was busy doing this, Bhagavan was actually standing right behind her. Swami made a few remarks expressing his apparent displeasure in the way the idols were being adorned. When my mother heard this, she immediately turned around and what did she see? In stead of Swami, it was the Divine Mother! The form of Sakthi Swaroopini! She was decked in a red silk saree; Her face was shining turmeric powder and vermillion; beautiful gold jewelry adorned Her neck. What a divine blessing Swami has conferred on her! It was just heavenly. She often recounted this glorious darshan with great fervour. In those cherished days, I was awed by the glory of Swami. We have not seen Lord Rama or Lord Krishna, but the present Avatar is living with us, amidst us! What a great opportunity!